I’ve been presenting on this topic for quite a while. It’s officially an obsession. And I’m happy to say there’s actually a lot of attention being paid to context lately, and that is a good thing. But it’s mainly from the perspective of designing for existing contexts in the world, and accommodating or responding appropriately to them. For example, the ubicomp community has been researching this issue for many years — if computing is no longer tied to a few discrete devices and is essentially happening everywhere, in all sorts of parts of our environment, how can we make sure it responds in relevant, even considerate ways to its users? Likewise, the mobile community has been abuzz about the context of particular devices, and how to design code and UI that shapes the experience based on the device’s form factor, and how to balance the strengths of native apps vs web apps. And the Content Strategy practitioner community has been adroitly handling the challenges of writing for the existing audience, situational & media contexts that content may be published or syndicated into. All of these are worthy subjects for our attention, and very complex challenges for us to figure out. I’m on board with any and all of these efforts. But I genuinely think there’s a related, but different issue that is still a blind spot: we don’t only have to worry about designing for existing contexts, we also have to understand that we are often designing context itself. In essence, we’ve created a new dimension, an information dimension that we walk around in simultaneously with the one where we evolved as a species; and this dimension can significantly change the meaning of our actions and interactions, with the change of a software rule, a link name or a label. There are no longer clear boundaries between “here” and “there” and reality is increasingly getting bent into disorienting shapes by this pervasive layer of language & soft-machinery. My thinking on this central point has evolved over the last four to five years, since I first started presenting on the topic publicly. 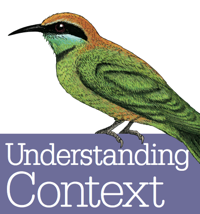 I’ve since been including a discussion of context design in almost every talk or article I’ve written. I’m posting below my 10-minute “punchy idea” version developed for the WebVisions conference (iterations of this were given in Portland, Atlanta & New York City). I’m also working on a book manuscript on the topic, but more on that later as it takes more shape (and as the publisher details are ironed out). I’m really looking forward to delving into the topic with the attention and breadth it needs for the book project (with trepidation & anxiety, but mostly the positive kind ;-). Of course, any and all suggestions, thoughts, conversations or critiques are welcome. I’m pasting the SlideShare-extracted notes below for reference. Here’s an excellent article written up at the ASIS&T Bulletin, by some talented and thoughtful folks in Europe (namely Andrea Resmini, Katriina Byström and Dorte Madsen). I’ll quote the end of the piece at length. Even if someone’s ideas about information architecture are mind-boggling, if they do not discuss them in public, embody them in some communicable artifact and get them to be influential, they are moot. This reality is the main reason behind the upcoming peer-reviewed scientific Journal of Information Architecture, due in Spring 2009. For the discipline to mature, the community needs a corpus, a defining body of knowledge, not a definition. No doubt this approach may be seen as fuzzy, uncertain and highly controversial in places. Political, even biased. But again, some overlapping and uncertainty and controversy will always be there: Is the Eiffel Tower architecture or engineering? The answer is that it depends on whom you ask, and why you ask. And did the people who built it consider themselves doing architecture, engineering or what? The elephant is a mighty complex animal, as the blind men in the old Indian story can tell you, and when we look closer, things usually get complex. The IA community does not need to agree on a “definition” because there is more to do. An analytical approach must be taken on the way the community sees itself, with some critical thinking and some historical perspective. The community needs to grow roots. We hope the Journal will help along the way. Months ago, I posted the first part of something I’d been presenting on for over a year: a simple way of thinking about social design choices. I called it the “Cultivation Equation for Social Design.” I should’ve known better, but I said at the end of that post that I’d be posting the rest soon … then proceeded to put it off for a very long time. At any rate, here’s the second part, about Motivation. The third part (about Moderation) will be forthcoming, eventually, but I make no promises on timing. In the closing talk for this year’s IA Summit, I had a slide that explains the various layers that make up what we use the term “Information Architect” (or “Information Architecture”) to denote. I think it’s important to be self-aware about it, because it helps us avoid a lot of wasted breath and miscommunication. But I also stressed that I don’t think this model is only true of IA. So please, feel free to replace “IA” in the diagram with the name of any practice, profession or domain of work. To understand this diagram, especially the part about Practice, it helps to have a basic understanding of what “practice” is and how it emerges from a community that coalesces around a shared concern. The Linkosophy deck gets into that, and my UX as Communities of Practice deck does as well, while getting into more detail about the participation/reification dynamic Wenger describes in his work. Here’s the model: I’ll do a bit of explanation after the jump. Simulation: the catalyst for IA & IxD? In the “Linkosophy” talk I gave on Monday, I suggested that a helpful distinction between the practices of IxD & IA might be that IxD’s central concern is within a given context (a screen, device, room, etc) while IA’s central concern is how to connect contexts, and even which contexts are necessary to begin with (though that last bit is likely more a research/meta concern that all UX practices deal with). I think we have, and we haven’t. Both of these practices build on earlier knowledge & techniques that emerged from practices that came before. Card sorting & mental models were around before the IA community coalesced around the challenges of infospace, and people were designing devices & industrial products with their users’ interactions in mind long before anybody was in a community that called itself “Interaction Designers.” That is, there were many techniques, methods, tools and principles already in the world from earlier practice … but what happened that sparked the emergence of these newer practice identities? The key catalyst for both, it seems to me, was the advent of digital simulation. For IA, the digital simulation is networked “spaces” … infospace that’s made of bits and not atoms, where people cognitively experience one context’s connection to another as moving through space, even though it’s not physical. We had information, and we had physical architecture, but they weren’t the same thing … the Web (and all web-like things) changed that. For IxD, the digital simulation is with devices. Before digital simulation, devices were just devices — anything from a deck chair to an umbrella, or a power drill to a jackhammer, were three-dimensional, real industrially made products that had real switches, real handles, real feedback. We didn’t think of them as “interactive” or having “interfaces” — because three-dimensional reality is *always* interactive, and it needs no “interface” to translate human action into non-physical effects. Designing these things is “Industrial Design” — and it’s been around for quite a while (though, frankly, only a couple of generations). The original folks who quite consciously organized around the collective banner of “interaction designer” are digital-technology-centric designers. Not to say that they’ve never worked on anything else … but they’re leaders in that practitioner community. Now, this is just a comment on origins … I’m not saying they’re necessarily stuck there. But, with the digital-simulation layer soaking into everything around us, is it really so limiting to say that’s the origin and the primary milieu for these practices? Of course, I’m not trying to build silos here — only clarify for collective self-awareness purposes. It’s helpful, I believe, to have shared understanding of the stories that make up the “history of learning and making” that forms our practices. It helps us have healthier conversations as we go forward. Author Andrew HintonPosted on April 16, 2008 June 24, 2018 Categories UncategorizedTags communities of practice, IA, Information Architecture, Interaction Design, IxD5 Comments on Simulation: the catalyst for IA & IxD? In 2008 I had the distinct honor to present the closing plenary for the IA Summit in Miami, FL. Here’s the talk in its entirety. Unfortunately the podcast version was lost, so there’s no audio version, but 99% of what I had to say is in the notes. Giving this talk at the IA Summit was humbling and a blast; I’m so grateful for the positive response, and the patience with these still-forming ideas. If you’re after some resources on Communities of Practice and the like, see the post about the previous year’s presentation which has lots of meaty links and references. Some very nice and well-meaning people have asked me to speak as the closing plenary at the IASummit conference this year, in Miami. This is, as anyone who has been asked to do such a thing will tell you, a mixed blessing. But I’m slogging through my insanely huge bucket of random thoughts from the last twelve months to surface the stuff that will, I dearly hope, be of interest and value to the crowd. Or, at the very least, keep their hungover cranial contents entertained long enough to stick around for Five-Minute Madness. “Linkosophy” is a homely title. But it’s a hell of a lot catchier than “Information Architecture’s Role in the UX Context: What Got It Here, What It’s About, and Where It Might Be Headed.” Or some such claptrap. At times, especially in comparison to the industrial and academic disciplines of previous generations, the User Experience family of practices can feel terribly disorganized: so little clarity on roles and responsibilities, so much dithering over semantics and orthodoxy. And in the midst of all this, IA has struggled to explain itself as a practice and a domain of expertise. But guess what? It turns out all of this is perfectly natural. To explain why, we’ll use IA as an example to learn about how communities of practice work and why they come to be. Then we’ll dig deeper into describing the “domain” of Information Architecture, and explore the exciting implications for the future of this practice and its role within the bigger picture of User Experience Design. Seriously, it should be a fascinating panel — we’ve been discussing it on a mailing list Christian set up, so there should be some sense that we actually prepared for it. Andrew Hinton Powered by WordPress.com.